1. Alto Moncayo Garnacha Campo de Borja 2007, 93 Points, $50- Exotic, explosive nose of sinus-opening mint, lavender and violet above vanilla bean, black cherry and blackberry fruit. Gorgeous and velvety on the palate, with rich, bursting blackberry and cherry fruit leading into layers of toffee, orange peel spice, violet perfume and subtle smoked game. Complex as can be, with white pepper spice creeping in late and expressive fruit lingering long with soft but gripping tannins. 2. Vall Llach Priorat 2005, 92 Points, $90- Very deep and perfumey with its juicy blackberry and cedar notes. Velvety palate, with thick blackberry, toffee and cedary forest floor elements. Classic perfumed, deep fruit style but also very dark, with a hint of tar creeping in late with dark chocolate and exotic spices. Deepens through the finish with a tannic grip. 3. Alvaro Palacios Finca Dofi Priorat 2005, 92 Points, $85- Intense, concentrated purple fruit on the nose: dark plum, raisin, blueberry, fig. Smooth, elegant and polished, with ripe plum, currants and black licorice above layers of mineral, oak and exotic spice. Long, sustained finish, bursting with dark fruits and spice. 4. Alto Moncayo Garnacha Veraton Campo de Borja 2007, 92 Points, $30- Lots of toasty oak on the nose above elegant black plum, dark raspberry and spice box aromas. Perfumey body of floral black and purple currant fruit, with raisin, blackberry, spicecake and plum notes above creamy oak and loads of peppery spice. Long finish with hints of toffee creeping in along with intense, spicy fruit lingering. Drinking quite well for its youth with impressive depth of flavor. 5. Alvaro Palacios Finca Dofi Priorat 2006, 91 Points, $85- Lush, fruity nose of red cherry, raspberry and mineral. Initially minerally on the palate, with a body of creamy red plum, cherry and licorice that leads into tobacco and herb spice through the long finish. Pretty tannic and still needs time. 6. Marc Rippol Sans Closa Battlet Gratallops Priorat 2004, $50- Juicy blackberry and dark plum aromas with hints of oak and black olive. Dark violet perfume and cassis fruit flavors mingle above hints of leather, cocoa, maple syrup and exotic spice. Long finish, very deep and lush. A big wine, but maintains elegance with just a touch of new oak lingering. 7. Vall Llach Embriux Priorat 2006, 90 Points, $30– Supple aromas with black cherry, red licorice and mineral notes. Very floral, with violet, blackberry, cherry and exotic spice. Lovely body, with hints of white chocolate along with orange and floral spice creeping in. Moderately tannic, but spice adds balance through the finish. 8. Domini de la Cartoixa Clos Galena Priorat 2005, 90 Points, $40- Creamy cherry and French oak aromas with minty mineral undertones. Very elegant, with cedar and forest floor notes combining above violety black cherry and blackberry. Exotic spice lingers with silky tannins and a hint of mineral through the finish. 9. Alvaro Palacios Les Terrasses 2006, 89 Points, $35- Dark red cherry, oak and mineral aromas. Soft on the palate, with elegant cherry and dark raspberry fruit above well-balanced oak, mocha and mineral notes. Firm tannins still here but fruit is pumping through the finish. 10. Cellar Cal Pla Mas’ En Compe Porrera Priorat 2006, 89 Points, $40- Explosive red cherry and licorice aromas with a hint of vanilla bean. Suave and elegant, with vibrant red fruits pumping above smoke, mineral and white pepper spice. Long finish with a hint of vanilla and oak creeping in last of all. 1. Vinedos de Paganos La Nieta 2006, 94 Points, $150- Lush, concentrated, perfumey blackberry aromas above subtle mineral. Deep black currant fruits are shaded by hints of coffee bean and floral orange peel spice. Elements of leather, chocolate and white pepper spice creep in late. Super-elegant and focused, long finish with soft tannins. 2. Artadi Pagos Viejos 2006, 93 Points,$90- Elegant aromas of smoky oak, dark plum and blackberry. Soft on the palate with its vivid blackberry, black licorice and plum notes leading into complex undertones of smoke, graphite mineral and herbs. So soft on the palate, exquisite mouthfeel and texture. Long, beautiful finish that deepens with perfumey black fruit pumping. 3. Bodegas Muga Rioja 2006, 89 Points, $25- Pretty aromas of violet and blackberry. Concentrated body with perfumey blackberry, plum and black cherry above minerally spice and a subtle chocolate note. Balanced through the long finish, with a refined, smooth texture all the way through. 4. R. Lopez de Heredia Bosconia Rioja Reserva 2000, 89 Points, $35- Hint of barnyard earth evolves into elegant cherry crème on the nose. Rustic yet soft and delicate on the palate with red cherry, licorice, subtle oak and mineral pumping. Finessed, with earth and herb notes carrying the creamy fruit through the long finish. 5. Marques de Vargas Rioja Reserva 2004, 89 Points, $30- Loamy, barnyard earth aromas above perfumed red berry fruit. Rustic style, with red cherry and raspberry fruit understated and layered with mineral, mint and tobacco, soft but substantial. Long finish with white pepper spice lingering. 1. Emilio Moro Tinto de Toro Ribera del Duero 2006, 92 Points, $25- Massive aromas of smoke, blackberry and herbal spices. More present, perfumed fruit here than usual, with focused blackberry, plum, black cherry and fig leading into layers of smoked meat, café mocha and exotic spice that finish with a chalky note and linger long. Complex and muscular, with more fruit expression than previous vintages. 2. Emilio Moro Malleolus Ribera del Duero 2005, 91 Points, $65- Lots of oak and hints of green vegetable shade smokey, leathery black currant fruit aromas. Juicy black cherry and dark raspberry notes on the palate with undertones of smoke, cedar and lots of creamy oak and lead pencil elements. Firm and structured through the long finish, with a tannic grip that should soften with time. 3. Dominio de Pingus Flor de Pingus Ribera del Duero 2006, 91 Points, $100- Deep and toasty, with blackberry, black cherry and mineral aromas. Intense and chewy initial fruit body of dark plum, blackberry and cherry with undertones of toffee and peppery spice. Dark and tarry mid-palate, with roasted coffee, leather and beef notes creeping in with hints of mineral. A blockbuster style that is still very tannic and oaky through the finish, needs time. 4. Bodegas Aalto Ribera del Duero 2005, 90 Points, $60- Dark aromas of black fruit, chocolate and green earth. Very deep, chewy body, with hints of charred oak, tar, leather and coffee shading the black fruit notes through the impressive finish. Lots of grip here from the tannins, cries for food. 5. Bodegas y Vinedos Montecrasto Ribera del Duero 2005, 89 Points, $50- Deep plum, fig and licorice aromas. Rich purple fruit flavors coat the palate, with sweet blackberry and licorice notes above its smoke and burnt oak hints. Juicy fruit lingers through the finish with an exotic floral spice note. OTHER REGIONS- Toro, Jumilla, etc. 1. El Nido Jumilla 2007, 95 Points, $105- Deep purple fruit, mineral, toffee and smoke aromas, impressive layers even on the nose. Full-bodied mouthfeel of leathery cassis and dark plum fruit, violet, smoked meat, pepper spice and the slightest hint of orange peel. Finishes with a complex gravel and mineral note which lingers for minutes with the fruit. Structured, layered and constantly evolving, powerful wine all the way through, more exotic fruit present but missing that chocolate element in this vintage. Cabernet Sauvignon and Monastrell. 2. Bodegas Triton Tinta del Toro 2008, 92 Points, $20- Expressive bouquet reveals smoked meat above savory cassis fruit notes. Incredibly soft on the palate, with complex notes of heavy smoke, mocha and mineral combining above subtly perfumed blackberry and black licorice notes. Black pepper spice lingers with smoked meat notes, but this feels very elegant all the way through the long finish. A spectacular value, and it’s great to see this winemaker back with this new venture. 3. Avanthia Mencia Valdeorras 2008, 91 Points, $70- Funky bouquet of smokey earth and purple fruit. Velvety, elegant body of dark plum and blueberry above smoke and loam notes, deep and creamy with impressive balance. Mineral spice lights up the long, leathery finish. Tasted twice with consistent notes. 4. Teso La Manja Almirez Toro 2007, 89 Points, $25- Musky purple fruit aromas with notes of coffee bean. Pasty palate of dark plum, fig and blackberry lead into dark mocha and tar notes. Hints of clove spice creep in through the long finish. Very full and dark. 5. Bodegas Juan Gil Monastrell Jumilla 2007, 88 Points, $15- Deep, juicy blackberry and blueberry aromas above mineral and exotic spice notes. Hints of soy run through the dark currant fruit body, thick and juicy, with lots of spicy mineral undertones and a hint of tar lingering with the fruit. 1. 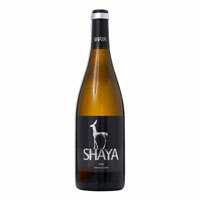 Shaya Old Vines Verdejo Reuda 2008, 88 Points, $15- Pretty aromas of lemon and pear fruit above undertones of mint. Balanced, rich citrus notes include green apple and lemon mid-palate, leading into a creamy finish of spicy ginger, orange zest and white pepper. Hints of vanilla linger through the long vibrant finish. 2. Bodegas Muga Blanco Rioja 2007, 87 Points, $15- Orange peel, smoke and earth notes combine in the nose. Spicy, complex palate, with green apple, pear, canteloupe and orange above smokey spice and a mineral hints. Long, vibrant finish. Viura and Malvaisa. 3. Paso a Paso Verdejo La Mancha 2008, 87 Points, $10- Lots of tropical melon fruit on the nose combines with lemon and lime notes. Creamy body with lots of melon and lime citrus lead into a crisp, refreshing mineral finish. 4. La Cana Albarino Rias Biaxas 2008, 86 Points $15- Tropical fruit aromas of pear and pineapple with undertones of green apple. Creamy mouthfeel shows vibrant acidity beneath its bright citrus fruit notes. Medium length. 5. Marques de Gelida Brut Cava 2005, 86 Points, $15- Lots of crisp green apple and pear citrus on the nose. Lively acidity, with flavors of pear, apple and peach above notes of bread dough and light sourness. Refreshing through the medium length. Well, that certainly felt good! Lookin’ at Lucky turned the tables on Super Saver after his first clean trip in three races, and made a monster move around the far turn to overtake the surprisingly hot pace, which is almost certainly what cost Super Saver any chance here. But how impressive was First Dude? After setting decimating and entirely unexpected fractions, he still battled Lucky down the stretch and amazingly held on for the place spot ahead of a hard closing Jackson Bend and Yawanna Twist, who both also ran quite well close to the pace. Suffice to say I’m glad that First Dude’s distance Tomlinson number caught my eye and I ended up using him under Lucky in the exacta instead of Aikenite. Had I known that the first 1/4 was going to go in :46.2 I might have had a different opinion, but First Dude stayed the course anyway. Sweeeeet victory! Comments: Comments Off on VICTORY! 1) Lookin at Lucky (98 Beyer, PP#7, 3-1)- Had yet another disastrous trip in the Derby from the dreaded #1 post and fell way too far back early to have a shot at the board, and still rallied impressively to finish 6th. This might actually be his ideal distance, and this is his last chance to prove he’s for real as he finally gets an ideal post starting in the middle of the field. The pace scenario isn’t as favorable as it was for him in the Derby, but I can’t jump off now…with a clean trip, I think he’s still the most talented runner in the field and will probably be positioned a bit closer to the lead. We’re all still waiting for his coming out party. I just hope he isn’t worn down after one of the roughest campaigns in recent memory. 2) Super Saver (104 Beyer, PP#8, 5-2)- Derby winner could very well dictate the pace, and his ascending Beyers in last three starts suggest a horse that is continuing to reach his full potential. He’s impossible to leave out especially considering if he has it his way he could wire the field with ease, but if he runs into any trouble getting to the lead, it’s important to remember that Borel isn’t at Churchill anymore. Still, the top two appear to vastly outclass the rest of the field. 3) Schoolyard Dreams (94 Beyer, PP#2, 15-1)- Showed a strong turn of foot in the Tampa Bay Derby, beating the eventual Derby winner while getting a few pounds, and had excuses (health issues?) in his 4th place Wood Memorial finish. Aside from that effort he’s never missed the board, and he is working extremely well and is fresh after missing the Derby earnings cut; all signs point to improvement in the near future. His running style should fit just fine here, as he’ll enjoy a ground saving trip just behind the front runners. 4) First Dude (90, PP#11, 20-1)- He’ll probably be close to the pace as well and deserves a close look based on his field-high Tomlinson distance rating. He’s actually a half brother to Schoolyard Dreams, both sired by Stephen Got Even, so I suppose if I like that one I have to respect him as well. I’m not sure he has demonstrated the same versatility and turn of foot, and he’s still waiting for an above average speed figure, but he stands a good chance to sit off the pace and may very well just keep on going. Pleasant Prince had his number in the Florida Derby but the pace collapsed in that race, and Paddy O’Prado beat him very narrowly in the Blue Grass. He’s fresh and training well, and looks like a live longshot at these odds. 5) Paddy O’Prado (100 Beyer, PP#10, 9-2)- A repeat of his 3rd place Derby finish will have him in 2nd here, but how much did he benefit from the mud on Derby Day? Is he tired after that huge effort? A bounce candidate? He sure seems to change leads a lot as he tires, and he still has yet to prove himself on a dry dirt track. I’m looking elsewhere but admittedly frightened, and might be sorry on Saturday night, but you can’t use everyone, especially since he figures to take a lot of action at the windows. 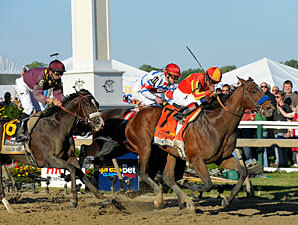 6) Dublin (98 Beyer, PP#12, 10-1)- Seems to be always there at the end but still refuses to pass anyone down the stretch. He improved upon each furlong in a respectable 7th place finish in the Derby, arguably his best effort to date, but hung again without any excuses. Would need to take a leap forward here and may be gassed after a pretty tough spring campaign. You can’t ever count D. Wayne Lukas out completely, and he stands to benefit from Gomez taking over, but I still think he lacks that killer instinct in the stretch. 7) Aikenite (91 Beyer, PP#1, 20-1)- Looked much improved in his second place Derby trial effort, closing on the winner from far back, a style that suits him much better than chasing the pace. He’s been beaten twice by Jackson Bend but seemed to be gaining ground in shorter races, and may be ready to turn the tables. However, closers may be up against it this time based on the likely pace scenario, and I can’t get past the fact that he’s been handily beaten by half of the field in previous races. 8- Jackson Bend (93 Beyer, PP#6, 12-1)- Always tries, but still has distance issues. He will definitely be closer to the pace than usual in this race, which could work to his benefit if he can get away with really slow fractions, but I have a feeling Super Saver will have something to say about that. The feeling here is that this is more of an 8f horse, and that making the lead will likely make those last 300 yards even more difficult than usual. 9) Pleasant Prince (99, PP#3, 20-1)- Flattered by Ice Box’s 2nd place finish in the Derby; he lost to that one by a nostril in the Florida Derby but that effort has looked somewhat like a fluke since. He had excuses in a dismal Blue Grass over polytrack but didn’t really fire or make a strong move in his next outing in the Derby Trial even with its fast fractions, and was beaten handily buy some of these there. He probably needs a much hotter pace (46ish, like what he got at Gulfstream in his best race to date) than he will get here. 10) Caracortado (98, PP#9, 10-1)- Closing type is talented and will probably get some support at the windows but won’t have a super hot pace to run at. In response, he may attempt a style shift and go with the pace, but I probably don’t have to tell you how I think that will turn out. He moves to dirt for the first time, but distance figures (lowest Tomlinson figure in the field- by a mile) and pedigree suggest this isn’t his best spot. 11) Yawanna Twist (96 Beyer, PP#5, 30-1)- I have to admit that I was impressed with his Gotham performance, as he closed hard to nearly overtake winner Awesome Act, another strong closer. However, as mentioned, I don’t feel like this is a race to play more than one closer in, and he is probably a step behind in terms of class. He may try to go early as well, which gives him a fighting chance, but won’t be my play. 12) Northern Giant (92 Beyer, PP#4, 30-1)- Probably the only horse in the field that I can’t really make a case for. Seems like he needs a shorter race and a sloppier track. Last month I focused on Italian wine, and over the course of this month I’ll be concentrating heavily on wines from just west across the Mediterranean in the very diverse country of Spain. You can expect a full tasting report towards the end of the month, but for now, here’s an entry level wine from a great producer (their flagship Grenache was one of my favorite Spanish wines of the 2006 vintage) that delivers the power of a top level wine for half the price. Buy it (and drink it) up while it is still around. Lots of toasty oak on the nose above elegant black plum, dark raspberry and spice box aromas. Perfumey body of floral black and purple currant fruit, with raisin, blackberry, spicecake and plum notes above creamy oak and loads of peppery spice. Long finish with hints of toffee creeping in along with intense, spicy fruit lingering. Drinking quite well for its youth with impressive depth of flavor. Oops! Running behind a bit here. Let’s take a look at the 2007 vintage from the Douro Valley in Portugal. This region grows an abundance of unique, indigenous red fruit that saw one of its best vintages ever in 2007. In fact, there is plenty of Vintage Port hitting the marketplace at bargain prices, including the highly acclaimed Dow’s which the Wine Spectator awarded a rare 100 point score (I scooped up two bottles but won’t be tasting it any time soon). For less intense examples of wine from Portugal, you can’t go wrong with these fruity, minerally blends from the Douro. All are great values for the overall quality of the wines, and one that I tasted recently merits mention here. Bright, vibrant aromas of red plum and wild berry fruit above soft smokey mineral notes. Plush, concentrated body of red plum, cherry and wild raspberry fruit above an edge of green olive and herb spice. Long finish, substantial, creamy fruit lingers with a hint of smoke. Tinta Roriz, Touriga Franca, Tinta Barocca.